Th-INK-ing of You: Our Daily Bread designs Release Blog Hop! Hello and welcome to the Our Daily Bread Designs February Release Blog Hop! If you arrived here from Chris' Blog, you are in the right place! If not, you might want to start at the Our Daily Bread designs Blog to be sure you hop in the correct order, because we are having a Scripture Hop, and you will be collecting our Secret Scripture Words as you hop along, so you will want them in the order given! You have until Thurs. Feb 4th at 8:00PM EST to complete the requirements to be eligible to win. There will be THREE BLESSED WINNERS... who will each receive a $15.00 Gift Certificate to the Our Daily Bread designs Store to go toward the stamps of their choice! Winners will be randomly chosen from all the qualified entries. Hop from blog to blog in the order given below, writing down the secret words you will find clearly written in their posts, and leaving a comment on each blog. Return here and leave a comment that you completed the hop and left comments for each designer. In the email, give me the secret words you found in order .... they will spell out a Scripture verse. For an extra chance to win, send me another email telling me the Scripture reference where the verse can be found. If for any reason a link is broken, simply return to the Our Daily Bread designs Blog to see who is next on the list, leaving a space for the missing words. Most often if you can't get on a blog or leave a comment now.... if you wait a little while and try again you usually can. I first saw the idea for this birdhouse used by Christine and I used the basic pattern for this lantern box on Stampin Mindy's blog, but making it a bird house. 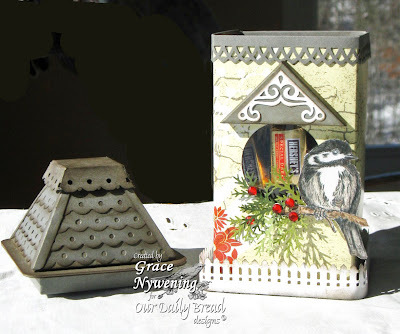 The Chickadee image is from the new Feb. Our Daily Bread designs release, You Will Find Refuge, as is the tiny nest I stamped on the inside of the card. The sentiment is from the new release, Nest. I used designer paper from My Big Idea, Gray Bazzill and lots of T Holtz distress ink in Walnut Stain. Shingles are made with layers of punched edges with Fiskars Threading Water punch. For the card I made my own template based on the bird house box. The dimensions are 4 1/4" wide and 5 3/4" high. From top (fold) measure down ea. side 1 1/2" and make a dot. From ea. side at top measure in 1 1/4" inch and make dot. Draw diagonal line dot to dot and cut. I cut the circle with my SB circle and placed the sentiment inside the card. Cute irl.... but hard to photograph without shadows! Accessories: Cuttlebug Corner Die Cut, MS Lattice Punch, Fence Punch, Greenery Punch, Prisma Pencils and Gamsol, Spellbinders Small Classic Circle die cut, Acetate for box windows, chipboard for box base and base of lid. I was just so excited about ALL these new sets this month that I just had to show you another project I made, using the set called Nest. I used this Lang Mug as my inspiration and I think these would make a great themed gift idea! This card is on a Cranberry Crisp base and used scraps of designer paper from SU! Recollections, K&Co, , a.t.d. Great Outdoors Scrapbook Kit, and the Paper Co. The image is stamped on Very Vanilla and colored with Prisma Pencils, cut with a Spellbinder's Label 1, sponged while in the die and layered onto Cranberry Crisp and torn marbled gold dp. The ribbon is from my stash and the pearls are Queen & Co. Wouldn't this make a great gift with the mug filled with some goodies? These sets are so versatile! I have a ton of ideas running through my head! Thank you so much for stopping by today! I hope you have enjoyed my projects~ Now on to enjoy the rest of the hop! I can't wait to see who will win!!! From here, hop to Debi's Blog and have fun! OMGoodness Grace!!! I simply ADORE that birdhouse!! So genius of you to turn the lantern into a birdhouse! the set is just FABulous! ok...and that mug!! AWEsome inspiration!! LOVE the card, and yes, perfect gift idea!!! WOWOWOWOWOW!! These are both sooo amazing, Grace! LOVE that lantern/bird house...how perfect! That mug set...what a beautiful gift this will make!! These are such gorgeous projects Grace!!! I so LOVE your birdhouse and just may have to case it. Your matching card is ingenious! Love the mug set...what a wonderful gift!! You always inspire me my friend! Grace, your projects are awesome! Love the birdhouse...it's adorable! Thanks for your part in blog hop! Grace I absolutely love both of your gift sets! They are phenomenal! You do such amazing work! wow, they are fantastic! !Such creativity!! Oh my WORD Grace Stunning work...GORGEOUS GORGEOUS GORGEOUS! What a great idea! I love the bird house. Thanks for sharing your work. I love the clors you have used and your red bow is beautiful. Thank you for the inspiration. Your projects are great. The bird house is awesome. Love the bird house. I am so glad I found this site, love the music. your projects are Just beautiful. Your projects are fantastic. I can see that these sets are definitely going on my wish list!! Love, love your creations. You are truly an inspiration. Thank you for all you share. Thanks for the projects and cards. These help me think about a different shape. Love the cup. Beautiful card and wonderful gift ideas! Thanks! Your creations are just stunning. Love that birdhouse box. I am speechless, Great and beautiful projects and cards! What stunning projects Grace. They are beautiful. WONDERFUL.... God has blessed your will a beautiful gift! Your projects are stunning. I can hardly believe that they are handmade! Thanks for a wonderful blog and comforting music too! Sure do love the colors of this card. So glad to see "spring" images. Wow, they just keep getting better, what a fabulous selection of gifts from these sets. Just beautiful! Talk about talent! Simply gorgeous. Creative genius, Grace!!! LOVE your ODBD projects! Just had to leave you a comment Grace to let you know that your work is simply BEAUTIFUL! Your projects are just beautiful. I especially love the candy holder. Thanks for sharing your projects with us. OMG...This bird house and card are unbelievable, Just awesome details. Your lantern box bird house is GREAT! Loved it. these projects rae gorgeous and so well worked. I just might move if someone would send me one of these adorable "Nests". Hugs & Hershey Kisses. ml. Look at all this eye candy! Love it! Truly gifted, you are! Just love these projects!! The birdhouse is just wonderful! My husband and I are both bird lovers so these are a special treat. Excellent work and ideas! I am fascinated with HOW you used the images!!! Beautifully done and incredibly creative!! These are just over the top gorgeous, Grace! 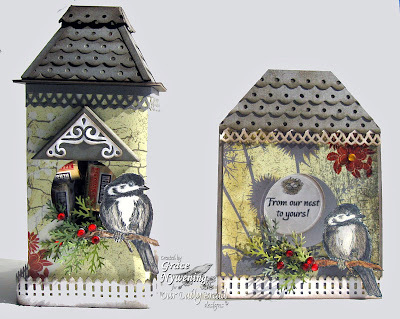 The bird house lantern is just wonderful and the inspired by mugs cardinal is perfect. You did an amazing job on these! Inspiring projects. Love love the bird house. Thanks for sharing. Oh my goodness Grace, I'm picking my jaw up off of the floor. What a magnificent project! These are just so lovely!!!! 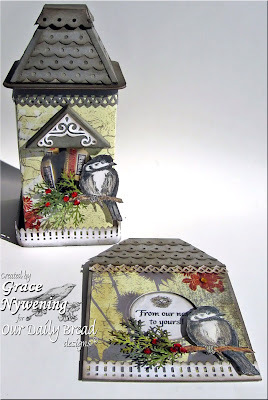 I love the bird stamp and the really nice home for the bird! Beautiful creations you have made, Grace and just love them all. 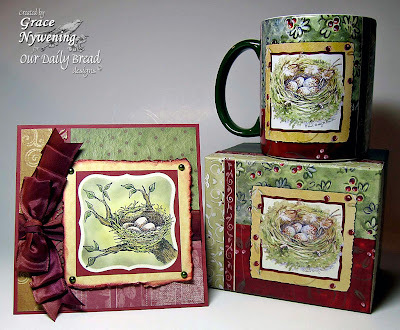 The birdhouse is so pretty and the mug and card set would make a very lovely gift. Thanks so much for sharing. Oh my, I LOVE the projects with the nest stamp - so sweet! i just love the roof on the bird house. so creative and the bow on your card just blew me away. The birdhouses are so, so sweet! Your bird house box is gorgeous and the card you made from the mug inspiration, I would love to receive myself! Wow Grace what a beautiful project and card. Hugs, Nellie. You are so talented! What an inspiration you are being to so many. Thank you for sharing your joy of stamping and paper crafting! Everything you did is beautiful, but my favorites are the birdhouse with the candy and the card. I especially like the card layout and the colors on it. What a great way to do the shingles. I love learning new ways to use punches. OMGosh, Grace!!! I was stunned into silence when I saw your GORGEOUS creations! That birdhouse candy container and coordinating card are masterpieces!! Your second ensemble is just as exquisite..the rich colors are PERFECT! Oh my! how beautiful. I love all of your projets. What an amazing display of talent! You are incredible! How did you attach your work to the mug, or did you work right on it? It is amazing! I love the birdhouse! I think I will try to make one...my father-in-law used to have about 40 birdhouses in his yard. He is in an "adult living" now and has no yard. I'll hang it in the house. Amazing projects, I love them all. Your creations are amazing! !Your are so talented!!! Amazing, creative, unique, beautiful, gorgeous, inspirational and....I like it too!! Your talent knows no bounds! Your work is so amazing! The projects are beautiful. The nest card is such a match to your mug. Great job! Grace, your projects here have absolutely blown me away!!! I am *almost* speechless! lol!!! What a blessing you are to this team...not just because you make the most gorgeous projects, but you have the most sincere, beautiful heart!! Love ya bunches!!! Lovely projects. I especially enjoyed the music! Grace,, Bless you heart wonderful work.. Thank you for sharing. What a neat idea with the birdhouse box! Beautiful job! Thank you for sharing your talents! Really adorable ideas and I LOVE the stamps!! Thanks so much for sharing your unique ideas. Oh my Grace!!!! You have outdone yourself today!!!! I LOVE LOVE LOVE your birdhouse project and your card is lovely!!!! Wow, Grace!!! You blew the top off of this challenge...literally!!! What adorable projects! Absolutely gorgeous!!! ***THUD*** OMGosh Grace these are mind blowingly INCREDIBLE!!!!! I'd say more but my jaw is on the floor!!!! The birdhouse is impressive, especially thinking outside the box. (I couldn't help myself). The roof made with the punch is a very clever idea. The card is fantastic. Your friends will love receiving the gift. Wow, these are just amazing creations!! Gorgeous! These projects are stunning. I love the birdhouse box. Very clever use of the border punch for the "shingles". That little chickadee is so cute. I love the bird house--how inventive! Beautiful bird stamp. You are so talented. Thank you for sharing your gift with us. Your birdhouse card is so creative. first I saw the birdhouse & thought, "oh my goodness...how cute is this!" Then I saw your card...how I love how this aligned perfectly with the inspiration. So wonderful, Grace!! Grace you just blew me away with the bird house, the intricate and wonderful detail...and then the nest set too! WOW! Just amazing...the colors are so fabulous with the nest card too. You've really shown these sets to their wonderful potential. The birdhouse is absolutely AMAZING! I love it! So pretty, Grace. Love your birdhouse. Wonderful projects!! Love the bird house treat box, I will have to try my hand at it. Love the color combos and images, the bow is beautiful! I LOVE birds and nature images. These are just beautiful. Thanks for your inspiration. Very cool projects! I especially like the card with it's beautiful colors and that bow! Hello Grace, nice to meet you. You have a very nice blog. I love the birds, and your kitty, lol. He looks very contented. What amazing projects these are! Love the colors you used on them. I think that these are awesome! Thanks for inspiring and sharing your gift! Grace, I'm at a loss for words about how phenomenal all of your projects are! WOW is all I can say! I love the work you did. The details are great! Thanks for sharing this with us. What a cute idea w/the birdhouses! Thanks! Love the birdhouse, love your color combinations, love the links so hopefully I can find a minute to CASE!! TFS! Beautiful! This is my first blog hop and I'm thrilled at what I'm seeing so far! You ladies are soooo talented. Thanks for sharing. Beautiful work! I LOVE the nest gift set the most! Amazing work, thanks for inspiring me and pushing me to a new adventure. Beautiful work thanks for sharing with us ! Grace, I love your projects. Such a great idea to create the card to match the mug/box. It is awesome. Your projects are just as amazing as can possibly be! Such vivid detail and coloring - wonderful! Like the colors in these. Your work has a unique artistic flair. Stunning! I'm a birdhouse fiend, and never imagined such a gorgeous project. Bravo! Beautiful !! I just love the nest!! The birdhouse is adorable - but the nest is drop-dead gorgeous!!! I love the way you colored it - beautiful!!! I love your work! Great idea for a house warming gift. I love the birdhouse. Everything about this project is beautiful. I would love to do something similar to give to family members and special friends. Thank you for sharing. Nice brief and this mail helped me alot in my college assignement. Say thank you you for your information. Your designs are too cute! I love the birdhouse! God bless you for making these gorgeous projects! Wonderful projects. The birdhouse is so cute with those punched shingles! And the card matches that mug perfectly! Incredibl Grae! How gorgeous is this birdhouse. You truly have a God-given talent when it comes to design! Gorgous stamp sets and projects! Wow, your bird house treat box is fabulous! I love the way you used the border punches, so creative! What great ideas and projects! Your little bird house treat holder is soooo cute! And then the card to coordinate with the mug - how wonderful! They really look like they belong together. Thanks for sharing! your birdhouse is awesome. Great projects. I love that sweet little bird. Your work is so beautiful! Thanks for sharing. LOVE the great ideas for a bird house! What a fabulous gift idea for anytime of the year. I love this project. I love birds and birdwatching so this is fabulous. I love the colors you used! Beautiful! Wow, what great projects! I love the bird house with yummy candy inside and matching card. The mug set was so creative, too. Thanks for sharing your amazing talent with us. Grace, what beautiful, creative work. Love that birdhouse and matching card. I may have to try that mug....beautiful. I am speechless. These are incredible! I wish I had as much talent as you have in your pinkie finger ! Grace. you have that amazing WOW power!!! I am completely blown away by your talents. Grace, OH MY Goodness they just get better and better al the time! WOW!!! I love love love the birdhouse and that card based on the mug is just to drool over. Gojuss! Your projects are just beautiful and really showcase the new ODBD sets! I love the birdhouse candy holder and your lovely "nest" card is very classy! Thanks for sharing. Love the bird house and matching card. Love the stamps, got to save my money for them. Fanatic projects and just love all the details. Thanks for this inspiring eye candy along this hop. What beautiful creations, Grace! The birdhouse is perfect, and I appreciate your adding an extra little project to inspire us! I love the mug!!! All of your projects are gorgeous inspiriation! Thanks!! And off I hop! What an awesome use of "scraps", Grace. Your work is always an inspiration to me! Great projects--you really matched the mug well. Grace - what can I say that everyone else hasn't already said? What totally gorgeous projects! All the details are completelly amazing. Your 2nd project set with the mug is also beautiful and so inspiring! Thanks for sharing with us! So gorgeous! Your talent amazes me. What fabulous projects Grace! Your birdhouse is amazing!!! You always amaze me with your ideas, they are so creative. Oh. My. Gosh! Your projects are absolutely stunning! Oh My! What stunning creations! Your work takes my breath away! Thank you for sharing. I love your projects!! I'm always interested to see how others use the same "toys" that I have such as punches, etc. Your work is gorgeous!!! This is my first blog hop... I'm having so much fun!! Grace, your creations are adorable. I've enjoyed looking! What gorgeous projects--thanks for sharing!! What a creative use for the punch...a roof for a bird house. How creative! I've got to give this a try. Thank you so much for the indirect challenge. Oh, my! Such amazing work! The birdhouse and both cards are just so beautiful! I just loved your projects, it is nice to make a card for someone special. WOW! Lots of BEAUTIFUL artistic expression. So pretty - so unique! Very nice.. These are fabulous projects. Thanks for sharing your amazing talent. I love this amazing creations! those are amazing projects. stunning, beautiful, and I could go on.